The Los Angeles metropolitan area, also known as Metropolitan Los Angeles or the Southland, is the 20th largest metropolitan area in the world and the second-largest metropolitan area in the United States. 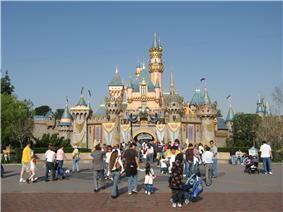 It is entirely located in the southern portion of the U.S. State of California. 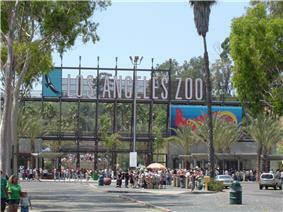 The metropolitan area is defined by the Office of Management and Budget as the Los Angeles-Long Beach-Anaheim, CA Metropolitan Statistical Area (MSA), consisting of Los Angeles and Orange counties, a metropolitan statistical area used for statistical purposes by the United States Census Bureau and other agencies. Its land area is 4,850 sq. mi (12,562 km²). Los Angeles and Orange counties are the first and third most populous counties in California respectively, and Los Angeles, with 9,819,000 people in 2010, is the most populous county in the United States. The combined Los Angeles metropolitan area is home to 18.2 million people, making it the most populous metropolitan area in the western United States and the largest in area in the United States. The metro area has at its core the Los Angeles-Long Beach-Anaheim corridor, an urbanized area defined by the Census Bureau with a population 12,150,996 as of the 2010 Census. The Census Bureau also defines a wider region based on commuting patterns, the Los Angeles-Long Beach, CA Combined Statistical Area (CSA), more commonly known as the Greater Los Angeles Area, with an estimated population of 18,238,998. This includes the three additional counties of Ventura, Riverside, and San Bernardino. The total land area of the combined statistical area is 33,955 sq. mi (87,945 km²). The counties and county groupings comprising the Los Angeles Metropolitan Area are listed below with 2012 U.S. Bureau of the Census estimates of their populations. Metropolitan Los Angeles as viewed from the Getty Center. 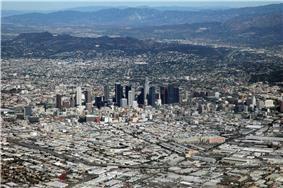 Skyline of Downtown Los Angeles in the background, Century City and Westwood in the foreground. 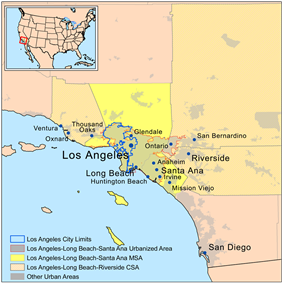 The Los Angeles-Long Beach, CA CSA is a multicore metropolitan region containing several urban areas. 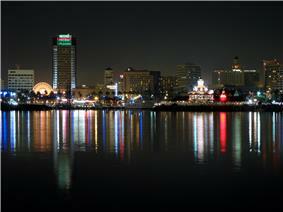 View of downtown Long Beach. 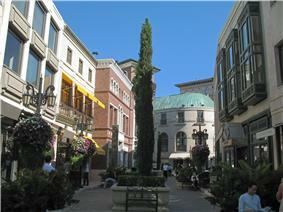 The economy of the Los Angeles metropolitan area is famously and heavily based on the entertainment industry, with a particular focus on television, motion pictures, interactive games, and recorded music – the Hollywood district of Los Angeles and its surrounding areas are known as the "movie capital of the United States" due to the region's extreme commercial and historical importance to the American motion picture industry. Other significant sectors include shipping/international trade – particularly at the adjacent Port of Los Angeles and Port of Long Beach, together comprising the United States' busiest seaport – as well as aerospace, technology, petroleum, fashion and apparel, and tourism. The City of Los Angeles is home to five Fortune 500 companies: energy company Occidental Petroleum, healthcare provider Health Net, metals distributor Reliance Steel & Aluminum, engineering firm AECOM, and real estate group CB Richard Ellis. Other companies headquartered in Los Angeles include American Apparel, City National Bank, 20th Century Fox, Latham & Watkins, Univision, Metro Interactive, LLC, Premier America, Gibson, Dunn & Crutcher, DeviantArt, Guess?, O’Melveny & Myers; Paul, Hastings, Janofsky & Walker, Tokyopop, The Jim Henson Company, Paramount Pictures, Sunkist Growers, Incorporated, Tutor Perini, Fox Sports Net, Capital Group, and The Coffee Bean & Tea Leaf. Korean Air's US passenger and cargo operations headquarters are located in two separate offices in Los Angeles. 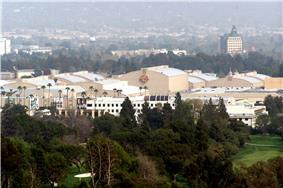 Entertainment and media giant The Walt Disney Company is headquartered in nearby Burbank. If the Greater Los Angeles CSA were counted as a country it would have the 15th largest economy in the world in terms of nominal GDP, placing it just below Australia and above the Netherlands, Turkey, Sweden, Belgium, and Indonesia. The Los Angeles-Long Beach-Riverside combined statistical area (CSA) also has a gross metropolitan product (GMP) of $831 billion (as of 2008), which makes it the third largest economic center in the world, after the Greater Tokyo Area and the New York-Newark-Bridgeport CSA. 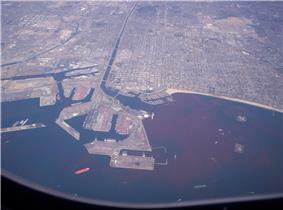 The Port of Long Beach is the 2nd busiest container port in the United States. It adjoins the separate Port of Los Angeles. Acting as a major gateway for U.S.-Asian trade, the port occupies 3,200 acres (13 km2) of land with 25 miles (40 km) of waterfront in the city of Long Beach, California. The seaport boasts approximately $100 billion in trade and provides more than 316,000 jobs in Southern California. The Port of Long Beach import and export more than $100 billion worth of goods every year. The seaport provides the country with jobs, generate tax revenue, and supporting retail and manufacturing businesses. Southern California Edison serves much of the Los Angeles metropolitan area except for Los Angeles city limits, Burbank, Glendale, Pasadena, Azusa, and Anahiem. According to the 2009 American Community Survey, the Los Angeles Metropolitan Area had a population of 12,874,797, of which 6,402,498 (49.7% of the population) were male and 6,472,299 (50.3% of the population) were female. According to the survey, the Los Angeles Metropolitan Area was 54.6% White (32.2% non-Hispanic White alone), 7.0% Black or African American, 0.5% American Indian and Alaska Native, 13.9% Asian, 0.3% Native Hawaiian and Other Pacific Islander, 20.6% from Some other race, and 3.2% from Two or more races. Hispanics or Latinos of any race made up 44.8% of the population. Whites are the racial majority; whites of both Hispanic and non-Hispanic origin make up 54.6% of the population. Non-Hispanic whites make up under one-third (32.2%) of the population. Approximately 7,028,533 residents are white, of which 4,150,426 are non-Hispanic whites. Blacks are a sizable minority; blacks of both Hispanic and non-Hispanic origin make up 7.0% of the population. Non-Hispanic blacks make up 6.7% of the population. Approximately 895,931 residents are black, of which 864,737 are non-Hispanic blacks. In the survey, 136,024 people identified their ancestry as "Sub-Saharan African", equal to 1.1% of the population. American Indians are a small minority; American Indians of both Hispanic and non-Hispanic origin make up 0.5% of the population. American Indians of non-Hispanic origin make up 0.2% of the populace. Approximately 68,822 residents are American Indian, of which 26,134 are American Indians of non-Hispanic origin. Approximately 3,872 Cherokee, 1,679 Navajo, 1,000 Chippewa, and 965 Sioux reside in the area. Asians are a large minority; Asians of both Hispanic and non-Hispanic origin make up 13.9% of the population. Asians of non-Hispanic origin make up 13.7% of the population. Approximately 1,790,140 residents are Asian, of which 1,770,225 are Asians of non-Hispanic origin. "Other Asian" is an additional category that includes people who did not identify themselves as any of the groups above. This group includes people of Cambodian, Laotian, Pakistani, Burmese, Taiwanese, and Thai descent, among others. Approximately 166,665 people are in this category, and they make up 1.3% of the population. Native Hawaiians and other Pacific Islanders are a very small minority; Native Hawaiians and other Pacific Islanders make up 0.3% of the population. Approximately 37,719 residents are Native Hawaiian or of other Pacific Islander ancestries, of which 33,982 are of non-Hispanic origin. "Other Pacific Islander" is an additional category that includes people who did not identify themselves as any of the groups above. This group includes people of Fijian and Tongan descent, among others. Approximately 12,764 people are in this category, and they make up 0.1% of the population. Multiracial individuals are a sizable minority; multiracial people of both Hispanic and non-Hispanic origin make up 3.2% of the population, of which 1.8% were of non-Hispanic origin. Approximately 405,568 people are multiracial, of which 228,238 are of non-Hispanic origin. Hispanic or Latinos, are, by far, the largest minority group; Hispanics or Latinos make up 44.8% of the population. They do not make up a majority, but they make up a plurality, outnumbering every other individual racial group. Approximately 5,763,181 residents are Hispanic or Latino. "Other Hispanic or Latino" is an additional category that includes people who did not identify themselves as any of the groups above. This group include people of Costa Rican, Salvadoran, and Colombian descent, among others. Approximately 1,096,569 people are in this category, and they make up 8.5% of the population. The primary airport serving the LA metro area is Los Angeles International Airport (LAX), one of the busiest airports in the United States. 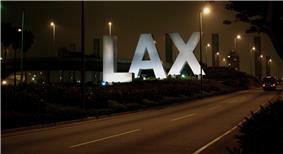 LAX is located in southwestern Los Angeles, 16 miles (26 km) from Downtown Los Angeles. LAX is the only airport to serve as a hub for all three U.S. legacy airlines —American, Delta and United. In addition to LAX, other airports, including Bob Hope Airport, John Wayne Airport, Long Beach Airport, and LA/Ontario International Airport, also serve the region. The Metro Rail is the mass transit rail system of Los Angeles County. It is run by the Los Angeles County Metropolitan Transportation Authority and its system runs five rail lines throughout Los Angeles County. Metro Rail currently operates four light rail lines and two rapid transit subway lines, altogether totaling 87.7 miles (141.1 km) of rail, 101 stations, and over 360,000 daily weekday boardings as of December 2012. The systems light rail system is the second busiest LRT system in the United States, after Boston, by number of riders, with 200,300 average weekday boardings during the third quarter of 2012. Since the region of the city is in close proximity to a major fault area the tunnels were built to resist earthquakes of up to magnitude 7.5. Both subway lines use an electrified third rail to provide power to the trains, rendering these lines unusable on the other three. The Blue and Gold Lines run mostly at grade, with some street-running, elevated, and underground stretches in the more densely populated areas of Los Angeles. The Green Line is entirely grade separated, running in the median of I-105 and then turning southward along an elevated route. The rail lines run regularly on a 5 am and midnight schedule, seven days a week. Limited service on particular segments is provided after midnight and before 5 am There is no rail service between 2 and 3:30 am Exact times vary from route to route; see individual route articles for more information. There are two providers of heavy rail transportation in the region, Amtrak and Metrolink. Amtrak provides service to San Diego, Santa Barbara, San Luis Obispo, and points in between on the Pacific Surfliner. It also provides long-distance routes, including the Coast Starlight which goes to the San Francisco Bay Area, Portland, Oregon, and Seattle, Washington; the Southwest Chief which goes to Flagstaff, Arizona, Albaquerque, New Mexico, and Chicago; and the Sunset Limited which provides limited service (three days a week) to Tucson, El Paso, Houston, and New Orleans. Metrolink provides service to numerous places within Southern California, including all counties in the region. Metrolink operates to 55 stations on seven lines within Southern California which mostly (except for the Inland Empire-Orange County Line) radiate from Los Angeles Union Station. The following is the list of ZIP codes for select areas within the metropolitan area. As a whole, the Los Angeles area has more national championships, all sports combined (college and professional), than any other city in the United States, with over four times as many championships as the entire state of Texas, and just over twice that of New York City. The Los Angeles metropolitan area is home to the headquarters of several well-known media companies including: the Los Angeles Times, Fox Broadcasting Company, Universal Studios, and The Walt Disney Company. Local television channels include KCBS-TV 2 (CBS), KNBC 4 (NBC), KTLA 5 (CW), KABC 7 (ABC), KCAL-TV 9 (Independent/CBS), KTTV 11 (FOX), KCOP 13 (myNetworkTV), KPXN-TV 38/30 (Ion), and KLCS 41/58 (PBS). Radio stations serving the area include: KKJZ, KIIS, KNX (AM), and KMZT. ^ List of Southland's worst schools released | abc7.com. Abclocal.go.com (2010-03-08). Retrieved on 2013-07-29. ^ Largest Metropolitan Areas in the U.S. – Most Populous Metros. Geography.about.com. Retrieved on 2013-07-29. ^ "Current Lists of Metropolitan and Micropolitan Statistical Areas and Definitions". ^ "Combined Statistical Area Population Estimates File for Internet Display". ^ a b Metropolitan and Micropolitan Statistical Areas Totals: Vintage 2012 - U.S Census Bureau. Census.gov. Retrieved on 2013-07-29. ^ "City and Town Totals: Vintage 2011". ^ "About Metropolitan and Micropolitan Statistical Areas". ^ "DeviantArt, Inc." Businessweek Investing. Accessed November 9, 2008. ^ "Contact Info". Korean Air. Retrieved September 20, 2008. ^ CIA World Factbook, 2009: GDP (Official Exchange Rate), October, 2008. ^ Los Angeles County Road Atlas (Map). Thomas Brothers. 2008. 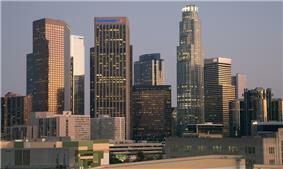 ^ Los Angeles County Metropolitan Transit Authority, Facts at a Glance, January 15, 2013. 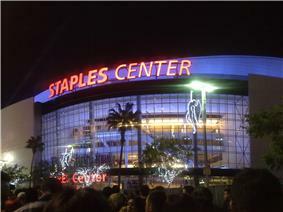 ^ "Los Angeles Sports Travel". Los Angeles Sports Travel.